The date of the opening reception for “Rooted in the Land” SE Minnesota Women Farmer project is April 14th, at the Winona County Historical Society. Please join us from 1-3pm for refreshments and to meet many of the women farmers. More to come about that later! 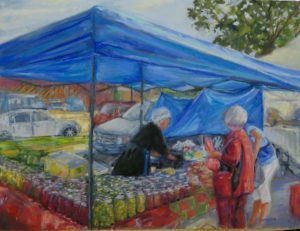 I wanted to share a little about Mary Slabaugh who is featured in the pastel painting below during the Winona Farmers Market last summer. Mary and her husband Amos have a picturesque farm in Lanesboro, MN. They are part of an Amish community there. Mary and Amos moved to this settlement from Ohio 29 years ago. They use horses to help work their farm. The family grows hay, corn and soybeans. They also have beef cows pigs, chickens and eggs. Mary runs her large family garden. She does all of the canning and preserving for the family and also has a booth at the Winona farmers market. Her product is all organic. I love her wide array of colorful preserves, lovely baked goods and beautiful smile.